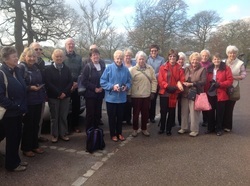 On April 1st a group of Kelsall WI and Huxley Tuesday walkers, including friends and three husbands, making a total of eighteen, enjoyed a visit to Dunham Massey organised by Marjorie Pritchard. Once the timed entry tickets for our visit to the house had been distributed we were free to do whatever we fancied. I think everyone visited the gardens which were delightful, with hellebores and spring bulbs putting on a colourful display, and unusual sculptures stimulating comments. There were two restaurants catering for the many hungry and thirsty visitors - one in the original outbuildings, the other near the entrance, was new, with plenty of tables outside. As it was a lovely Spring day they were being well used. There was also a pristine new visitors centre and shop. We all turned up at the appointed time for the visit to the house where there was plenty to see. During WW1 the house had been used as a hospital for wounded, gasses and shell-shocked soldiers. There were actors bringing the displays to life as we walked through the wards where so many young war-woulded men had been nursed. A primitive operating theatre in a hallway made us realise what advances have been made since then. It was very moving to read some of the soldiers' letters and their ordeals. A day of contrasts - sombre memories inside contrasting with everything outside bursting with new life. We were grateful to Marjorie for making all the arrangements. For more photos of this trip, please look at the gallery.